Thomas Jefferson was a learned man chiefly responsible for crafting the Declaration of Independence and the third president of the United States. Older students can summarize in their own words six of the many points Jefferson used to establish the facts of tyranny in the Declaration. Copy the phrase “thank you” in Latin, Greek, French, Spanish, and Italian. Explain how Jefferson learned so much. Copywork: We hold these truths to be self-evident, that all men are created equal, that they are endowed by their Creator with certain unalienable Rights, that among these are Life, Liberty and the pursuit of Happiness. View John Trumbull’s famous painting of the five-member drafting committee of which Jefferson was a member presenting the Declaration of Independence to Congress. 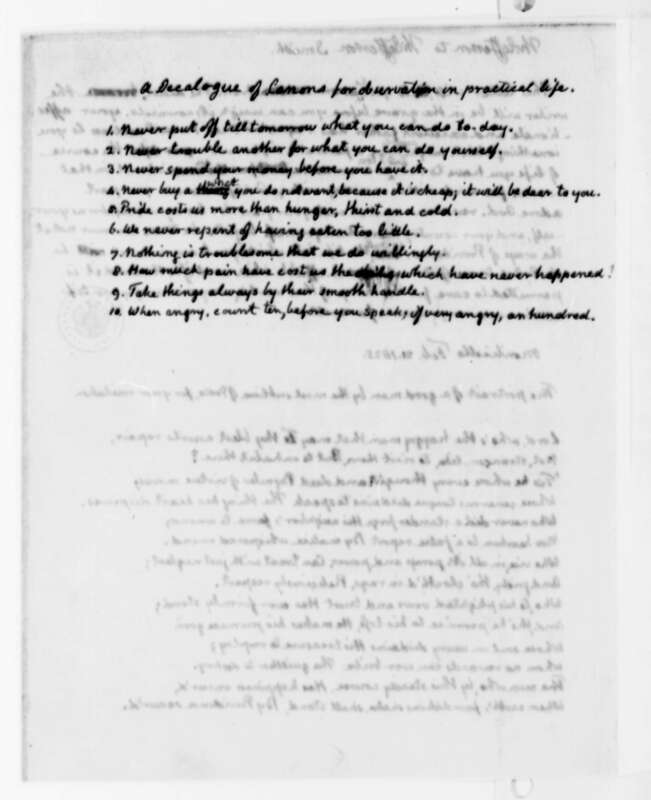 Jefferson, like Washington, wrote a few rules to live by which he titled “A Decalogue of Canons for observation in practical life.” Copy the ten rules and tell someone in your own words what each one means. Thomas Jefferson, third president of the United States, was born in 1743, near Charlottesville, Virginia. He received very little schooling as a boy, and became, like Washington, a surveyor, enduring the hardships of pioneer life. He was so fond of books and learning that he prepared himself for college. Bashful, yet warmhearted and eager for information, it was not surprising that Jefferson made many friends for himself in the College of William and Mary, at Williamsburg, Virginia…. He studied law and began to practice, but his chief interest was in farming. From his father he had a large tract of land and he bought more…. All his life he was trying experiments in farming. He introduced better machinery, invented a plow, and brought many kinds of trees and plants from different countries to find if they would grow in the United States. He was not to be allowed to remain on his plantations. Virginia and the nation had need of him. He served in the Virginia legislature, in the Continental Congress, where he wrote the Declaration of Independence, and as governor of Virginia. After the Revolution he served in Congress, and from 1784 to 1789 represented the country in France. After his return he was appointed Secretary of State by President Washington, but resigned in 1793. One of the reasons was private business, and the other the fact that he and Alexander Hamilton, also a member of Washington’s cabinet, could not agree. He was a candidate for president when Washington refused to accept a third term, but John Adams, of Massachusetts, was elected. It was the law then that the man who received next to the highest vote should become vice-president, and so Jefferson held that office for four years. In 1801 he became president, and served two terms. He might have been elected again, but, like Washington, refused the honor…. For the seventeen years following his retirement from office Jefferson lived at his home, Monticello, which became a resort for the great and noble minds in the country. But keeping open house to all who came ruined Jefferson financially. To his great grief, he was forced to sell his library, which he had been collecting for over fifty years. The money thus obtained was but a temporary relief. Some friends heard of his difficulties and raised the sum of $18,000. Jefferson was greatly touched by this proof of the loyalty and affection of his countrymen, but he did not live long to enjoy the relief thus given him. He died July 4, 1826. Few men of his time were interested in so many things. He loved mathematics, music and botany, knew several languages, and was a skillful architect. He was a fine shot and a good rider. More than all else, Thomas Jefferson believed that the people — all the people, not just a few at the top — should rule themselves. From the Thomas Jefferson Foundation. A day in the life of Thomas Jefferson from Monticello. A brief look at his farming interest from The Corporation for Jefferson’s Poplar Forest. Thomas Jefferson was quite an inventor as this list from the University of Virginia shows! He may have helped popularize macaroni and cheese! View Jefferson’s pasta machine at the Library of Congress. Take a virtual interactive tour of the plantation and house. In the performance of his everyday tasks, Thomas Jefferson meticulously recorded his observations, from documenting the first appearance of the peas in his vegetable garden and the number of bricks that it would take to build his garden pavilion to calculating the provisions allotted to his slaves. Jefferson’s daily habit of recording-keeping gave expression to his passion for scientific inquiry. Library of Congress interactive exploring the books in Thomas Jefferson’s library and their relation to his roles. Print a copy of the Declaration of Independence — signed with your own signature added! Recipe adapted for modern cooks at The History Chef! Landmark title that provides an introduction to Jefferson for younger readers. Chapter from A First Book in American History also by Eggleston that includes narration prompts. Chapter covering the Declaration of Independence from This Country of Ours by H.E. Marshall. Section from Beacon Lights of History Volume XI focusing on Jefferson as a statesman. For older students. Older students analyze Jefferson’s letter to the overseer at his Poplar Forest retreat. NationalMap.gov map for locating Charlottesville and Monticello. Coloring pages from the U.S. Mint. Featuring Thomas Jefferson at EnchantedLearning.com.